Food waste is a serious problem in the world today, and in developed countries, it’s practically inexcusable. 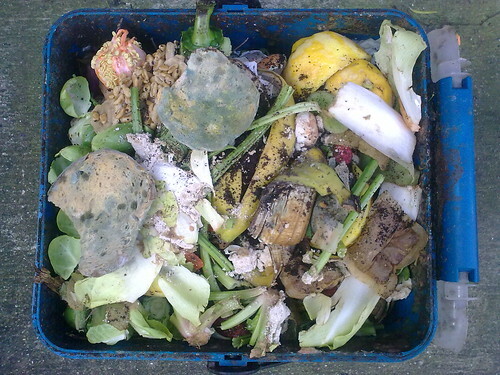 Americans threw away 33 million tons of food in 2010, according to the U.S. Environmental Protection Agency. All that uneaten, rotting food creates greenhouse gases in landfills, and needless to say it could have been put to much better use. Hard data is still being collected, but experts at the Reuters Food and Agriculture Summit in Chicago this week said an estimated 30 percent to 50 percent of the food produced in the world goes uneaten. The average American throws away 33 pounds of food each month — about $40 worth — according to the Natural Resources Defense Council, which plans to publish a report on food waste in April. In a year, that means each person throws away almost 400 pounds of food, the weight of an adult male gorilla. Manage your fridge like a chef. One of the most practical things I learned from cooking in restaurants was how to manage perishable, fresh food as inventory and think in terms of minimizing waste. It’s not hard to do, but it does require taking a mental inventory every couple of days of what’s in your fridge, what shape it’s in and what you may be buying too much of. You’ll develop a keen sense of use-it-or-lost-it time for that chicken thigh hiding behind all the leftovers or the head of cabbage in the crisper. Staying on top of what needs to be used also makes it easier to figure out what to make for dinner each night. Get familiar with shelf life and the best ways to store produce. Things like apples, potatoes and onions last a lot longer than tender produce like strawberries or lettuce (here’s a chart to guide you). Meanwhile, there are some simple rules to keep in mind for how to store various fruits and vegetables to keep them at peak freshness the longest. Embrace leftovers. It’s not a bad word, I promise. Instead of throwing out the leftovers from Sunday dinner, why not pack it for a couple lunches during the week? Or use some of the lettuce you need to eat up in sandwiches or as side salads you can munch during your lunch hour for a healthy meal. Leftovers, instead of being yucky, can actually be a great exercise in creative meal-planning. Make soup stocks. Just because the celery, carrots and apples in your crisper are no longer, uh, crisp doesn’t mean they’re useless. Rinse them and throw them together in a pot with water, bay leaves, whole peppercorns, potatoes or other root vegetables, onion and garlic (skins too) and a sprig or two of fresh parsley or other herbs and voila! Homemade soup stock, perfect for making soup, adding to vegetables for braising or freezing for later use. Here’s a good recipe for vegetable broth. Compost at home. If you have a yard, no matter how small, you have the means to compost leftover non-animal kitchen scraps and past-its-prime produce. This keeps food out of landfills or incinerators and gives you a steady supply of nutrient-rich black dirt to help fertilize trees and shrubs or add to your flower beds or home vegetable garden. Buy frozen food. If there are things you like to have around the kitchen but know you can’t go through quickly enough to keep from spoiling — say corn kernels, raspberries or large cuts of meat — then store them in the freezer for long-term food storage. Find tips for how to freeze food here. Buy dried foods. Cherries and cranberries, chiles, mushrooms, bananas, apricots — all are great examples of perishable produce whose lifespan can be vastly extended in dried form. That makes them perfect for rehydrating (or not) and adding to oatmeal, soup, scrambled eggs or whatever. What tricks do you use to avoid wasting food? 8. Meal planning is easier if you shop more often, daily if possible. In my experience less goes to waste because to can get the ingredients you need to accompany the item that is at risk of going bad.